Robert Loveman was an American southern poet and songwriter of the late 19th and early 20th century. His work does not warrant an especially significant place in the history of American literature but, during his lifetime, he was a very popular writer amongst both readers and literary critics. He does have at least two significant credits against his name though. His song Georgia was, for a time, the official state song of his home state of Georgia. His poem Rain Song, sometimes referred to as April Rain, was adapted and turned into a song for the famous Al Jolson. During his lifetime he rarely travelled far from his home and spent much of his time in Dalton. He was born on the 11th April 1864 into a prosperous Jewish family in Cleveland, Ohio but his family moved south while Robert was still young. He went to school in Dalton, Georgia at the Dalton Academy and then, in 1888, he went on to the University of Alabama. There, he achieved a Masters’ degree. While studying he lived with members of the Friedman family on Greensboro Avenue, Tuscaloosa, Alabama. He was able to do this through family connections. The Lovemans and Friedmans, coming from the early Jewish settlers, had done plenty of business together as well as being related by marriage. Loveman was indeed fortunate to secure such notable “student lodgings” in a house that has been listed on the National Register of Historic Places since 1972. 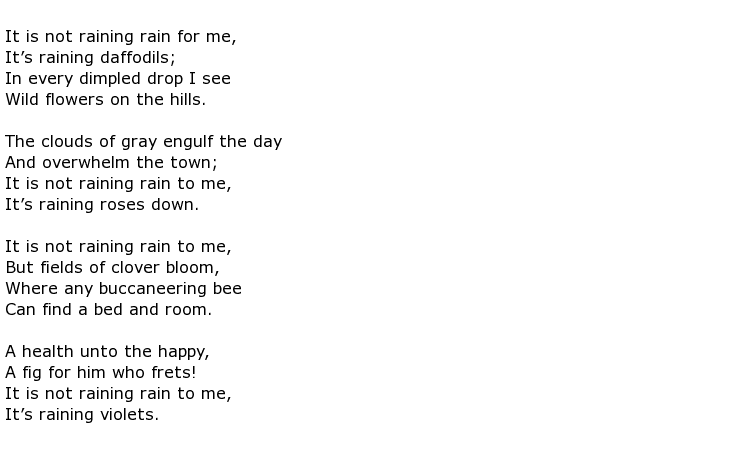 Al Jolson used words from this poem in his famous song April Showers, released in 1921, and it is certainly considered to be a classic song that is still sung today all around the world. Loveman’s song Georgia was used as Georgia’s official state song up to the year 1979, before being superseded by Georgia on My Mind. This can usually be found in the Hoole Library featuring interesting historical information on the early Jewish settlers in the area, dating back to the 1860s. Robert Loveman died on the 9th July 1923 in Hot Springs, Arkansas. He was 59 years old.